This is a Medium Grit Sanding Stick from Squadron Products. This is a Carded Large Round Router 2 pack from Excel. This is Tamiya's Electric Handy Drill Assembly Kit. This is a Seam Scraper from Squadron Tools. These are Professional Sprue Cutters from Xuron. This is a Grip-On Knife (Assorted Colors) from Excel. 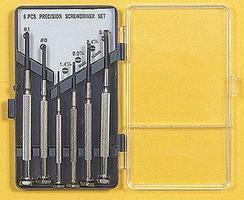 This is the 6 Piece Precision Screwdriver Set from Excel. This is a Light Duty Knife with Cap from Excel. All the supplies needed for basic model building. Great addition to any model purchase. This is a carded K30 Light Duty Rite-Cut Red w/ Safety Cap with a hexagonal plastic body knife for light cutting and trimming. Comes with safety cap and #11 blade. .438 x 4.75in. This is a Package of Five #33 Blades from Zona Tool Co. 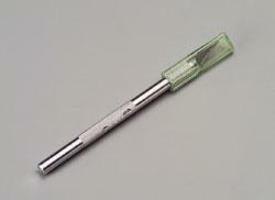 This is the Rivet Maker Tool from Trumpeter. This is a Deluxe Ship Modelers Set by Excel. The Ship Modelers Set includes several of the tools necessary for building model ships. This is a Set of Two Large Plastic Clamps from Excel. This is the Plastic Scriber II from Tamiya. The Track Cutter may be used by the RC Railroad modeler. The track cutter may be used for the S and HO scale, and the N and Z scale. This is a 2-56 Tap from K & S Engineering. This is a Swivel Head Pin Vise with 4 Chucks from Excel. 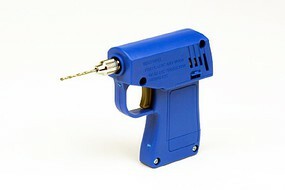 This is a Precision Cyanoacrylate Glue Applicator from Squadron Tools. 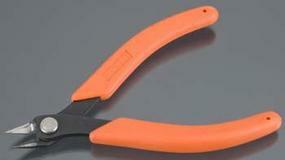 This is a Micro Shear Sprue Cutter from Testors.